Designated a World Heritage Site because of its well-preserved Baroque architecture, the city of Ouro Preto served as the state capital until local governance outgrew the scale of this pleasant valley settlement. Explore Ouro Preto's surroundings by going to Congonhas (Bom Jesus do Congonhas, Doze Profetas De Aleijadinho, & more). 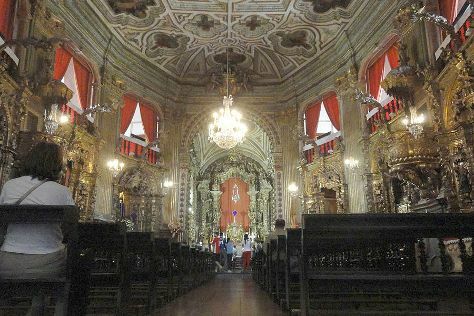 There's still lots to do: don't miss a visit to Centro Historico de Ouro Preto, admire the striking features of Igreja Nossa Senhora do Carmo, take an in-depth tour of Museum of Betrayal, and examine the collection at Oratory Museum (Museu Do Oratorio). To see more things to do, ratings, photos, and tourist information, read Ouro Preto journey builder app . Goiania to Ouro Preto is an approximately 6-hour combination of flight, bus, and taxi. You can also drive; or do a combination of bus and taxi. February in Ouro Preto sees daily highs of 36°C and lows of 25°C at night. Wrap up your sightseeing on the 4th (Mon) to allow time to travel to Uberaba. Situated in the floodplain of the Uberaba river, the municipality of Uberaba has emerged as a regional economic hub, largely as a result of its agricultural production. On the 5th (Tue), pause for some serene contemplation at Shrine of Nossa Senhora D'Abadia, get curious at Paleontological Research Center and Dinosaur Museum, examine the collection at Memorial Chico Xavier, then look for gifts at Shopping Center Uberaba, and finally pause for some serene contemplation at Shrine of the Miraculous Medal. Here are some ideas for day two: examine the collection at Memorial do Comercio, take in the architecture and atmosphere at Santa Terezinha do Menino Jesus Church, take in the architecture and atmosphere at Igreja de Sao Domingos, then explore the world behind art at Museu de Arte Sacra (MAS), and finally buy something for everyone on your list at Mercado Municipal. For ratings, photos, traveler tips, and tourist information, read our Uberaba itinerary planner . Explore your travel options from Ouro Preto to Uberaba with the Route module. In February, daytime highs in Uberaba are 34°C, while nighttime lows are 23°C. Wrap up your sightseeing on the 7th (Thu) to allow time to travel to Campos Do Jordao. Pointed roofs, wooden alpine houses, and mountain views typify Campos do Jordao, which at 1,628 m (5,341 ft) above sea level comes in as Brazil's highest city. Explore Campos Do Jordao's surroundings by going to Aparecida (Church of Sao Geraldo & National Sanctuary of Our Lady of Aparecida). Next up on the itinerary: admire the natural beauty at Amantikir Park, take some stellar pictures from Elephant Hill, take a stroll through Vila Capivari, and admire the landmark architecture of Portico da cidade. For where to stay, ratings, and tourist information, read Campos Do Jordao online road trip planner . Use the Route module to find suitable travel options from Uberaba to Campos Do Jordao. Due to the time zone difference, you'll gain 1 hour traveling from Uberaba to Campos Do Jordao. On the 10th (Sun), wrap the sightseeing up by early afternoon so you can drive back home.